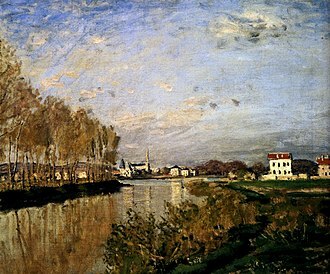 Bords de la Seine à Argenteuil (Banks of the Seine at Argenteuil) is an oil painting controversially not accepted by the Wildenstein Institute which publishes the catalogue raisonné of works by Claude Monet. The painting is a landscape depicting the River Seine at Argenteuil in France. It is owned by Englishman David Joel. In 2011 Bords de la Seine à Argenteuil was featured on the British TV programme, Fake or Fortune?, in a failed attempt to establish it as an authentic Monet. The painting was acquired by David Joel in 1992 for £40,000. Joel is an art historian who has published two art books, the first a catalogue raisonné of the marine paintings of Charles Brooking, the second a history of Monet at Vétheuil and on the Norman Coast. The painting had previously been offered for sale at auction, but failed to reach its £500,000 reserve. The title Bords de la Seine à Argenteuil along with the date, 1875, appears on the frame, and there is a painted signature of Claude Monet. In the years since he purchased it, Joel has attempted to establish it as an authentic Monet. The most widely accepted authority on Monet's work is the catalogue raisonné published by the Wildenstein Institute in Paris. The Wildenstein Institute has examined the painting once, after the death of Daniel Wildenstein, and does not accept it as genuine. Fiona Bruce (a journalist) and Philip Mould (an art dealer and historian) investigated the painting in the TV programme Fake or Fortune? first aired on 19 June 2011. The Art Access Research Centre scanned the picture using high resolution, infrared and X-ray photography. At the Lumiere Technology Centre the picture was scanned using a 240-megapixel camera and 13 light filters. 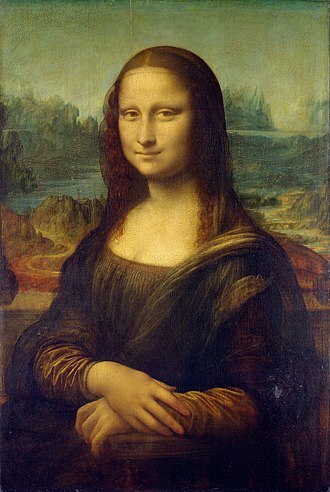 The resulting image was examined by Iris Schaefer, the head of conservation at the Wallraf-Richartz-Museum in Cologne, who previously uncovered a fake Monet which had been accepted by the Wildenstein Institute. In her opinion, the Joel painting was genuine. The chemical analysis of paints used in the painting and signature were studied by Nicholas Eastaugh (Courtauld Institute of Art) and were found to conform precisely with Monet's palette and the mediums he used in 1873. The programme had the brushwork and signature examined by experts who concluded that they were by Monet. The programme argued that the painting was genuine, an opinion shared by a number of experts, including Monet scholars Professor John House (Courtauld Institute of Art), Professor Paul Hayes Tucker, and others. However the Wildenstein Institute did not accept their arguments, and maintains that the painting is a fake, based predominantly on the connoisseurship of the late Daniel Wildenstein. The only photograph he would have had access to was a small 4 cm x 8 cm black and white copy in an obituary of Monet, written by René Chavange for Le Figaro Artistique in 1926. The painting was sold by Georges Petit in 1918 to the Khalil Palace in Cairo, where it stayed until 1953. It is known that Khalil bought a second Monet from Petit at the same time. This is W1520, Le pont aux nymphéas, signed but not dated, which remains in his collection in Cairo. Rodolphe Walter, of the Wildenstein Institute, confirms that all of Petit’s records were destroyed in World War II. As such, Daniel Wildenstein would have had no access to a photo of the painting other than the one in Le Figaro. The Institute has since been provided with further photographs. Daniel Wildenstein was sent a photograph in 1992 by Christie's, which was rejected. After the curator of the Khalil Museum discovered an original photograph sent by Petit to Mohamed Mahmoud Khalil in 1918 (discussed further below) Guy Wildenstein was informed, but did not change the verdict, relying instead on "connoisseurship". The stretcher has a label from the Paris art supplies dealer Latouche who is known to have had dealings with Monet and to have supplied canvases to a number of impressionist artists. The style of this label suggests the canvas was sold before 1884. On the back of the painting there is also a French railway sticker for transport from Paris to Argenteuil where Monet lived between 1871 and 1878. The back of the painting has a further sticker from a London gallery, Arthur Tooth & Sons, which handled a number of Monet paintings. The sticker has the number 3322. Gallery records show that it was acquired from Mahmoud Khalil, an Egyptian art collector whose collection is now housed in the Mohamed Mahmoud Khalil Museum in Cairo. The museum records show a large black and white photograph (16 cm by 30 cm) of the painting, sent by Paris art dealer Georges Petit, who owned the largest gallery in Paris in Rue de Seze. In June 1889 he mounted the great Monet/Rodin exhibition having persuaded his friend Monet to raise his prices. He showed 145 paintings, selling most of them. He remained Monet's second dealer, after Durand Ruel until he died in 1920. This photograph is the dealer's card, sent to Khalil in Cairo in 1918 and leading to his purchase of the painting. On the reverse of the photograph, in the top left corner, is written the number 5575, followed by "Claude Monet, Les Bords de la Seine a Argenteuil, 42.5x73cm". This number appears also on a label on the reverse of the painting itself (even the handwriting is identical). Stylistically, the label matches others which are known to be from the Georges Petit gallery, and the number implies that it was in Petit’s gallery in 1918, well before Monet’s death in 1926. The funeral was held at Giverny on 8 December, and the obituary was published by Le Figaro eight days later, illustrated by what appears to be the same photograph. 1881: Given by Monet in lieu of medical fees to Dr Charles Porak. 1915: Sold to Georges Petit, Paris. 1918: Bought by Mohammed Mahmoud Khalil, Paris and Cairo (died in Paris, 30 December 1952). 1953: 4 January sold via Andre Maurice, Paris, to Arthur Tooth & Sons. 1954: Sold to Sir Clifford and Lady Curzon. 1982: By descent to Fritz Curzon, Esq. 1993: Bought by David Joel. Exposition Française en Caire, 1827-1927, Collection of Mohammed Mahmoud bey Khalil, Cairo, cat. no.74. Memorial Exhibition to Dudley Tooth, London, November 1972, cat. no.7. Monet Retrospective (arranged by Professor Paul Hayes Tucker), Japan, 1994. Cat. no.26, travelled to Bridgestone Museum of Art, Tokyo, February–April, Nagoya City Art Museum, April–June, Hiroshima Museum of Art, June–July. Crane Kalman Gallery, Silence in Painting, October–December, 1999. Monet painted a number of scenes in the Argenteuil area. 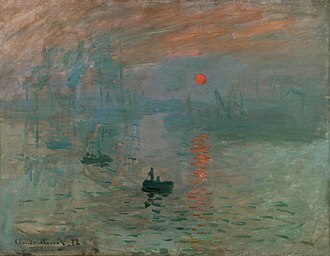 An acknowledged work with the same title was painted by Monet in 1872. This work was sold at a Sotheby's auction in New York for $4.8 million in 2005. Businessman Ralph Wilson acquired a Monet painting with the title La Seine a Argenteuil in 1997 from the San Francisco Museum of Modern Art. Wilson held the painting until his death in 2014, at which point it was put up for auction. Wilson's Monet is worth between $12 million and $17 million. ^ a b c d e f g h i j k l m n o p q r s t "Monet". Fake or Fortune?. Episode 1. 19 June 2011. BBC. Retrieved 4 August 2011. ^ "Mail Online". Dailymail.co.uk. 2011-06-12. Retrieved 2012-04-28. ^ Freeman, Len (2011-06-19). "BBC programme preview". Bbc.co.uk. Retrieved 2012-04-28. ^ The painting was included in "Monet: a Retrospective", curated by Tucker, Katsunori Fukaya, and Katsumi Miyazaki. Copyright by Bridgestone Museum of Art, Tokyo, 1994. ^ TV and Radio. "Telegraph programme review". Telegraph.co.uk. Retrieved 2012-04-28. ^ "Le Figaro Artistique, 16 December 1926, p.149 (Published eight days after Monet's death)". Imageshack.us. Retrieved 2012-04-28. ^ "Auction report". Nysun.com. Retrieved 2012-04-28. ^ Wawrow, John (June 5, 2014). Bills owner's estate auctioning off art collection. Associated Press. Retrieved June 5, 2014. Charles Brooking was an English painter of marine scenes. It is highly probable that Brooking’s father was a Charles Brooking who was recorded as employed by Greenwich Hospital between 1729 and 1736 as a painter and decorator, Charles Brooking senior had earlier been active in Plymouth and Ireland. On 27 November 1732 Master Charles Brooking was recorded as an apprentice and this painting is a huge sea piece intended to match another painting, whereabouts unknown, said to be of a “Fleet in the Downs”, by Peter Monamy. It is claimed that Dominic Serres received some instruction for a time from Brooking. Brooking is said to have died of consumption on 25 March 1759, brookings earliest known works are two pictures, one depicting a moonlit harbour scene and the other a burning ship, which he signed and inscribed with his age,17, and thus datable to 1740. Since he was described as a painter of sea-pieces in 1752. 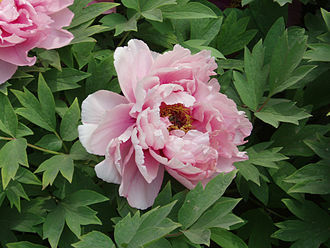 The mention by Ellis occurs in his Natural History of the Corallines, Ellis employed Brooking as a botanical draughtsman. This painting is now in the Greenwich Maritime Museum and his first two pictures show some influence of Peter Monamy, but he was already displaying strong signs of a distinctive personal manner. There is a group of paintings and prints, signed or inscribed Monamy and datable to the years circa 1745-1750, some of the identical prints occur with attributions by different print dealers to both painters in separate issues. Contemporary accounts suggest that he had been “much at sea” and he owned a small yacht. In his early years he was employed in some maritime capacity. Some of his works plainly show the influence of Willem van de Velde the Younger. The National Maritime Museum in Greenwich, London holds 23 of his oil paintings, a set of 28 engravings after his works. A plaque to Brooking was unveiled by the Lord Mayor of the City of London at Tokenhouse Yard in October,2008, a Natural History of the Corallines. The Treasures of the Foundling Hospital, Charles Brooking and the 18th Century Marine Painters. Woman with a Parasol - Madame Monet and Her Son, sometimes known as The Stroll is an oil-on-canvas painting by Claude Monet from 1875. Monets light and spontaneous brushwork create splashes of colour, mrs Monets veil is blown by the wind, as is her billowing white dress, the waving grass of the meadow is echoed by the green underside of her parasol. She is seen as if from below, with a strong upwards perspective, a boy, their seven-year-old son, is placed further away, concealed behind a rise in the ground, only visible from the waist up, creating a sense of depth. The work is a painting of an everyday family scene. The work was painted outdoors, en plein air, and quickly, probably in a period of a few hours. It measures 100 ×81 centimetres, his largest work in the 1870s, the painting was one of 18 works by Monet exhibited at the second Impressionist exhibition in April 1876, at the gallery of Paul Durand-Ruel. John Singer Sargent saw the painting at the exhibition in 1876 and was inspired to create a similar painting, Two Girls with Parasols at Fladbury. Snow at Argenteuil is an oil-on-canvas landscape painting from the Impressionist artist Claude Monet. It is the largest of no fewer than eighteen works Monet painted of his home commune of Argenteuil while it was under a blanket of snow during the winter of 1874–1875 and this painting—number 352 in Wildenstein’s catalogue of the works of Monet—is the largest of the eighteen. The attention to detail evident in the paintings is less evident in this larger picture. Instead, Monet has rendered large areas of the canvas in closely like tones and colours of blue, paint at the depicted road surface is thicker than elsewhere in the painting, and impasto is suggestive of the feel of disturbed snow. Most of Monet’s Snow at Argenteuil pictures from the winter of 1874–1875 were painted from locations close to the house on the boulevard Saint-Denis into which Monet, in December 1879 the painting was acquired from Monet by Théodore Duret. Recalling a conversation with the artist Édouard Manet, Duret years reported that, I had in my possession just such a piece from Monet. Philip Jonathan Clifford Mould OBE is an English art dealer and broadcaster. Mould is the author of two books on art discovery and is consulted by the media on the subject. He is well known for his role co-presenting the BBC television programme Fake or Fortune, the most watched arts programme on television. Mould was educated at Kingsmead School, Worth School, moulds father owned a factory in Liverpool and his family was based in the Wirral. He developed an interest in antiques at an age, thanks to his mother. She suffered polio as a child, and was in a wheelchair so would send Philip, aged six, into antiques shops to bring things out to her for inspection. Mould made friend with the owner of an antiques shop, who taught him to read hallmarks on silver when he was just 11 or 12 years old. Mould began art dealing in his teens and has since established a leading art dealership specialising in British art. He has sold works to institutions such as The Metropolitan Museum of Art, National Portrait Gallery, Museum of Fine Arts Boston, The Huntington. Mould has worked as a valuer for the Heritage Lottery Fund, between 1988–2010 he acted as honorary art adviser to the House of Commons and the House of Lords. 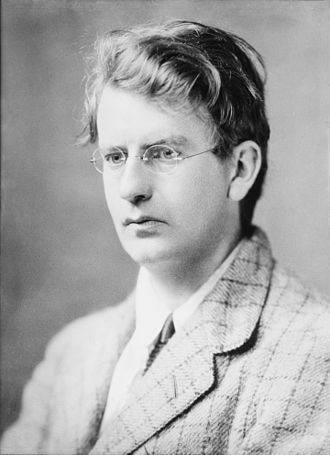 Mould is a supporter of CleanupUK, and Pond Conservation and he was elected as a fellow of the Linnean Society in 2012. Mould is a broadcaster and writer for the national press. His television work includes writing and presenting the Channel 4 series Changing Faces, in 2011, he began co-hosting the television programme Fake or Fortune. Now ranks as televisions most popular arts show - regularly drawing an audience of 5 million - and has an international following, in recognition of his art world expertise and contribution to portrait heritage he was created OBE in the 2005 New Year Honours list. In August 2014, Mould was one of 200 public figures who were signatories to a letter to The Guardian opposing Scottish independence in the run-up to Septembers referendum on that issue. He discussed the work of one of his artists, Cedric Morris. The San Francisco Museum of Modern Art is a modern art museum located in San Francisco, California. A nonprofit organization, SFMOMA holds an internationally recognized collection of modern and contemporary art, the museum’s current collection includes over 33,000 works of painting, photography, architecture and media arts. They are displayed in 170,000 square feet of space, making the museum one of the largest in the United States overall. SFMOMA reopened on May 14,2016, following a major expansion project. SFMOMA was founded in 1935 under director Grace L. McCann Morley as the San Francisco Museum of Art, for its first sixty years, the museum occupied the fourth floor of the War Memorial Veterans Building on Van Ness Avenue in the Civic Center. A gift of 36 artworks from Albert M. Bender, including The Flower Carrier by Diego Rivera, Bender donated more than 1,100 objects to SFMOMA during his lifetime and endowed the museums first purchase fund. The museum began its second year with an exhibition of works by Henri Matisse, in this same year the museum established its photography collection, becoming one of the first museums to recognize photography as a fine art. SFMOMA held its first architecture exhibition, entitled Telesis, Space for Living, SFMOMA was obliged to move to a temporary facility on Post Street in March 1945 to make way for the United Nations Conference on International Organization. The museum returned to its original Van Ness location in July, that year SFMOMA hosted Jackson Pollocks first solo museum exhibition. Founding director Grace Morley held film screenings at the beginning in 1937. In 1946 Morley brought in filmmaker Frank Stauffacher to found SFMOMA’s influential Art in Cinema film series, SFMOMA continued its expansion into new media with the 1951 launch of a biweekly television program entitled Art in Your Life. The series, renamed Discovery, ran for three years, Morley ended her 23-year tenure as museum director in 1958 and was succeeded by George D. Culler and Gerald Nordland. The museum rose to prominence under director Henry T. Hopkins. Since 1967, SFMOMA has honored San Francisco Bay Area artists with its biennial SECA Art Award, the positions of director of education and director of photography were elevated to full curatorial roles. It extends from the nominal red edge of the visible spectrum at 700 nanometers, to 1000000 nm. Most of the radiation emitted by objects near room temperature is infrared. Like all EMR, IR carries radiant energy, and behaves both like a wave and like its quantum particle, the photon, slightly more than half of the total energy from the Sun was eventually found to arrive on Earth in the form of infrared. The balance between absorbed and emitted infrared radiation has an effect on Earths climate. 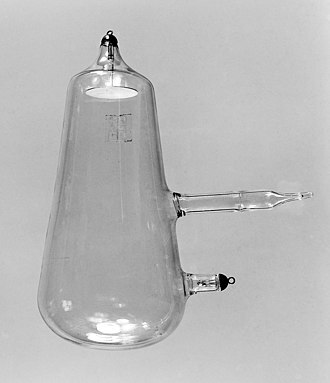 Infrared radiation is emitted or absorbed by molecules when they change their rotational-vibrational movements and it excites vibrational modes in a molecule through a change in the dipole moment, making it a useful frequency range for study of these energy states for molecules of the proper symmetry. Infrared spectroscopy examines absorption and transmission of photons in the infrared range, Infrared radiation is used in industrial and medical applications. 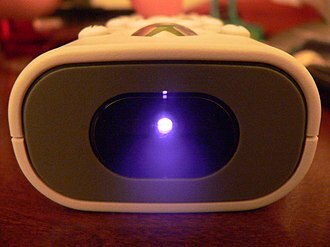 Night-vision devices using active near-infrared illumination allow people or animals to be observed without the observer being detected, Infrared thermal-imaging cameras are used to detect heat loss in insulated systems, to observe changing blood flow in the skin, and to detect overheating of electrical apparatuses. Thermal-infrared imaging is used extensively for military and civilian purposes, military applications include target acquisition, night vision and tracking. Humans at normal body temperature radiate chiefly at wavelengths around 10 μm, Infrared radiation extends from the nominal red edge of the visible spectrum at 700 nanometers to 1 mm. This range of wavelengths corresponds to a range of approximately 430 THz down to 300 GHz. Below infrared is the portion of the electromagnetic spectrum. Sunlight, at a temperature of 5,780 kelvins, is composed of near thermal-spectrum radiation that is slightly more than half infrared. At zenith, sunlight provides an irradiance of just over 1 kilowatt per square meter at sea level, of this energy,527 watts is infrared radiation,445 watts is visible light, and 32 watts is ultraviolet radiation. Nearly all the radiation in sunlight is near infrared, shorter than 4 micrometers. On the surface of Earth, at far lower temperatures than the surface of the Sun, almost all thermal radiation consists of infrared in mid-infrared region, much longer than in sunlight. Le Figaro is a French daily morning newspaper founded in 1826 and published in Paris. The oldest national daily in France, Le Figaro is one of the two French newspapers of record, along with Le Monde, and is one of the most widely respected newspapers in the world. In 2012, the paper had a circulation of 330,952 copies per issue. The paper is published in the format, switching from a broadsheet in 2009. The newspaper is owned by Le Figaro Group, whose publications include TV Magazine and Evene, the companys chairman is Serge Dassault, whose Dassault Group has controlled the paper since 2004. Le Figaro was founded as a weekly in 1826, taking its name and motto from Le Mariage de Figaro. 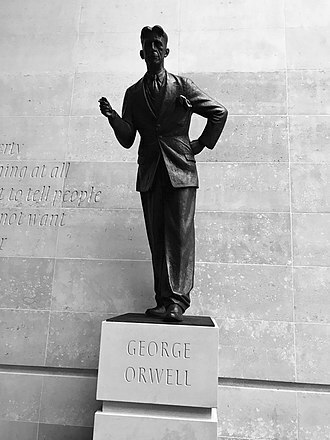 Its motto, from Figaros monologue in the final act, is Sans la liberté de blâmer. In 1833, editor Nestor Roqueplan fought a duel with a Colonel Gallois, who was offended by an article in Le Figaro, albert Wolff, Émile Zola, Alphonse Karr and Jules Claretie were among the papers early contributors. It was published irregularly until 1854, when it was taken over by Hippolyte de Villemessant. In 1866 Le Figaro became a daily newspaper and its first daily edition, that of 16 November 1866, sold 56,000 copies, having highest circulation of any newspaper in France. In 1922, Le Figaro was purchased by perfume millionaire François Coty, abel Faivre did cartoons for the paper. By the start of World War II, Le Figaro had become Frances leading newspaper, after the war it became the voice of the upper middle class, and continues to maintain a conservative position. In 1975, Le Figaro was bought by Robert Hersants Socpresse, in 1999, the Carlyle Group obtained a 40% stake in the paper, which it sold in March 2002. Dassault owns 80% of the paper, in 2006, Le Figaro was banned in Egypt and Tunisia for publishing articles allegedly insulting Islam. Le Figaro switched to Berliner format in 2009, the paper has published The New York Times International Weekly on Friday since 2009, an 8-page supplement featuring a selection of articles from The New York Times translated into French. In 2010, Lefigaro. Daniel Leopold Wildenstein was an art dealer and owner-breeder of thoroughbred race horses. He was the member of the family to preside over Wildenstein & Co. one of the most successful. He was once described as probably the richest and most powerful art dealer on earth, Wildenstein was born in Verrières-le-Buisson, just outside Paris. He was educated at Cours Hattemer and at the University of Paris, graduating in 1938, Wildensteins grandfather, Nathan Wildenstein, established an art dealership on the Rue La Boétie in Paris after fleeing his native Alsace during the Franco-Prussian War of 1870/71. He first specialised in 18th-century French painting and sculpture, expanding to Italian, Dutch, P. Morgan, Henry Clay Frick, and to the Kress and Mellon families. He opened a New York gallery in 1903 and one in London in 1925, the Wildensteins gained a reputation as shrewd businessmen, stockpiling works to maximise their profits when released onto the market. The secrecy attached to these holdings led to a deal of interest. In 1940 Daniel Wildenstein went to New York to work for the family firm and he had already acted as Group Secretary of the French Pavilion at the Worlds Fair in 1937 and as exhibitions director at the Jacquemart-Andre Museum. He took over the running of Wildenstein & Co. s Paris and New York branches in 1959 and those in London and Buenos Aires in 1963, a gallery in Tokyo was added in the early 1970s. As an art dealer Wildenstein was phenomenally successful, a 1998 profile of the family in Vanity Fair magazine asserted that his wealth was estimated at more than $5 billion. His fortune, the stated, was the only one of that magnitude ever made in the art market. Like his father, Daniel Wildenstein established a reputation as a scholar and his five-volume catalogue raisonné of the work of Claude Monet was published between 1976 and 1992. His two-volumes on Édouard Manet appeared in 1976 and 1977, those on Gustave Courbet in 1977 and 1977, and he acted as editor-in-chief of the Gazette des Beaux-Arts from 1963 and in 1971 was elected a member of the Académie des Beaux-Arts. Taking an X-ray image with early Crookes tube apparatus, late 1800s. The Crookes tube is visible in center. The standing man is viewing his hand with a fluoroscope screen. The seated man is taking a radiograph of his hand by placing it on a photographic plate. No precautions against radiation exposure are taken; its hazards were not known at the time. The atrium of the San Francisco Museum of Modern Art before the 2016 renovation. Poster by Maurice Réalier-Dumas (1860-1928) for the 15th "Exposition de la Société internationale de Peinture et de sculpture" at the galerie Georges Petit in Paris in 1897. March 1900 Announcement in The Studio of the First Exhibition of the Société Nouvelle de Peintres et de Sculpteurs at the Galerie Georges Petit in Paris. East Indiamen in a Gale, 45 x 48 inches, signed by Charles Brooking, c. 1759. National Maritime Museum. A Cart on the Snowy Road at Honfleur (1865 or 1867), Monet's first snowscape. 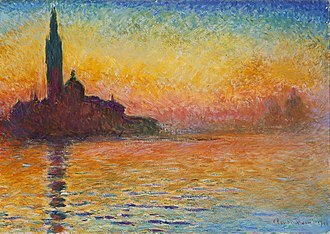 This photo separates the campanile and dome of San Giorgio Maggiore, as it is taken from a position nearer the Grand Canal than the dusk paintings. 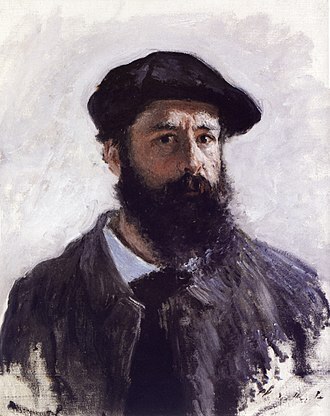 Portrait of Alfred Sisley, 1867-68, by Frédéric Bazille, Wildenstein Galleries, Paris, destroyed during World War II. A volume from Graham Reynolds's catalogue raisonné of John Constable.